Amtico, Karndean, Polyflor are some of the manufacturers of Luxury Vinyl Tiles or LVT’s. LVT’s are luxury vinyl tiles or planks designed to replica the look of natural stone tiles or woods. 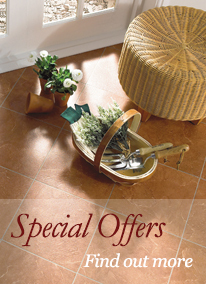 At May Flooring Limited we are highly experienced in the installation of Luxury Vinyl Tiles or LVT. We supply and fit all the popular brands and more, such as Amtico, Karndean, Polyflor, Tarkett etc. Luxury Vinyl Tiles are widely used in both the Commercial and Domestic environment. They are very hardwearing, give a desirable look and are easy to maintain and clean. With wide ranges of wood or tile, differ in size, colour and style, the choice is endless. The subfloor preparation is very important when installing LVT Flooring to give an optimum finish. Our estimate will include and detail the preparation work we recommend. This could include damp proof membrane, plywood, latex or water-based levelling screed. Softer and warmer to the touch than natural stone or wood. Easy to clean – a mop and routine cleaner is all that is required. Hardwearing – with long guarantee periods ranging up to 20 years. LVT are ideal for laying over under floor heating. In the unlikely event of damage, an individual tile or plank can easily be replaced without the need to replace the entire floor area. Producing the natural flooring look without the hassle. Flexibility – ideal for designs – from a simple border to inserting a motif or logo. For more information on Commercial Luxury Vinyl Tile Flooring please contact us or call us on 01635 32999 to discuss your requirements.